When conducting gender awareness trainings, one of the sessions I enjoy is listening to people from different cultures express what made them know they are boy or girl while growing up. While some are hilarious, many share how an adult made them realize what they were doing not appropriate for their gender. Habits like climbing trees were frowned upon for girls while habits like crying were quickly condemned for boys. Generally girls were encouraged to be submissive and obedient while boys were encouraged to fight and prove they are strong. Many men have memories of being made to fight off an aggressor to prove themselves. While childhood fights are encouraged by peers, for boys it was a mark of ‘manhood’ and the boy needed to prove that he is ‘a man’. A friend of mine shared how his dad locked him out of the house when he was running away from an older boy and made him fight. Is it any wonder that some of these boys grow up believing that the only way to prove they are real ‘men’ is to exercise power over others? Gender based violence is generally about exerting power over the victim. This can be done overtly or in a hidden manner. The issue of engaging men to understand about violence and the role they can and should play in stopping this has been discussed over many years. The issue of men engaging on issues of violence against women is sometimes frowned upon. I recall one gentleman involved in such projects share the kind of media coverage they received the first time they held a national conference. The media termed them as “men who are battered by women”. Recently during the “My Dress My Choice” campaign against stripping and violation of women in public some men joined in the demonstration. I remember seeing some comments on social media taunting these men and wondering what was wrong with them or what they were trying to prove. 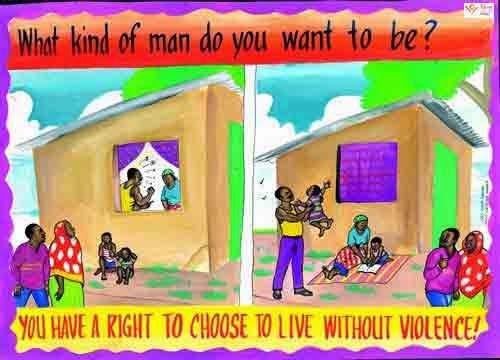 The involvement of men in promoting the rights of women is often questioned in the social arena. It is seen as not being man enough. The definition of ‘man’ has come to mean power and any misuse of this power is seen to be a proof. Women and men both contribute to the process of socializing children and end up passing these beliefs over and over again. We are therefore the same society that can change the talk. In younger days I used to hear a song that was popularly sang during weddings and we sang it until I grew and started questioning message. “Now that you have been married **(name of bride). Morning tea is going to be your role from now onwards. If you do not do it, slap and kicks. On the wedding day, the woman was prepared for violence and man given permission to do so if the woman ‘failed’ in those roles. Respect and obedience were emphasized from the woman to the man and not the other way round. The only way to ensure this happened would be through violence. In a world where about 50% are men and the rest women, it goes without saying that each of them has an important role in fighting gender violence. Despite any messages that are given about women and men, the boy will always watch what men are doing and aim to copy this. When men are seating in their social circles, they are going to influence each other in regard to how women are treated. The message of UN Secretary-General Ban Ki-moon should be heard far and wide. Men must teach each other that real men do not violate or oppress women – and that a woman’s place is not just in the home or the field, but in schools and offices and boardrooms. I am glad, that real men are standing up to be counted.